D'Angelo's Prince fandom is unquestionable. 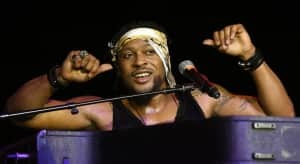 On recording, D'Angelo has covered Prince's "She's Always In My Hair," paid homage to him on "Untitled (How Does It Feel)," and sampled his drums on "Africa." He's worked other live Prince covers into his set as well; in 2013, he performed a rendition of "New Position" with Questlove at the Brooklyn Bowl. Last night D'Angelo took the stage on The Tonight Show to remember Prince by performing "Sometimes It Snows In April," one of the most devastating ballads in a catalog sprinkled liberally with them. The singer was aided by Maya Rudolph and Gretchen Lieberum, who have a Prince cover project of their own named Princess. Around the 4:50 mark, D'Angelo makes a small alteration to the lyrics: I often dream of heaven, and I know that Prince is there. Shortly afterwards, he appears momentarily overcome, unable to sing the line, I know that he has found another friend. Watch above.